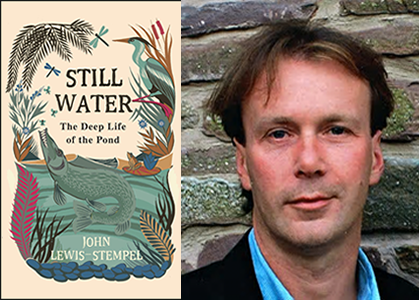 Join us for an evening with the award winning and bestselling nature-writer, John Lewis-Stempel, as he talks about his new book Still Water: The Deep Life of the Pond. The Pond. Nothing in the countryside is more humble or more valuable. It’s the moorhen’s reedy home, the frog’s ancient breeding place, the kill zone of the beautiful dragonfly. More than a hundred rare and threatened fauna and flora depend on it. Written in gorgeous prose, Still Water tells the seasonal story of the wild animals and plants that live in and around the pond, from the mayfly larvae in the mud to the patrolling bats in the night sky above. It reflects an era before the water was polluted with chemicals and the land built on for housing, a time when ponds shone everywhere like eyes in the land, sustaining life for all, from fish to carthorse. Still Water is a loving biography of the pond, and an alarm call on behalf of this precious but overlooked habitat. Above all, John Lewis-Stempel takes us on a remarkable journey – deep, deep down into the nature of still water. Widely regarded as one of the best nature-writers of his generation and twice winner of the Wainwright Prize for Nature Writing we’re delighted to welcome John Lewis-Stempel back to Booka. Tickets: £5 (redeemable against a signed copy of Still Water). Includes a glass of wine or soft drink on arrival. Tickets available from the bookshop or purchase online (with booking fee).